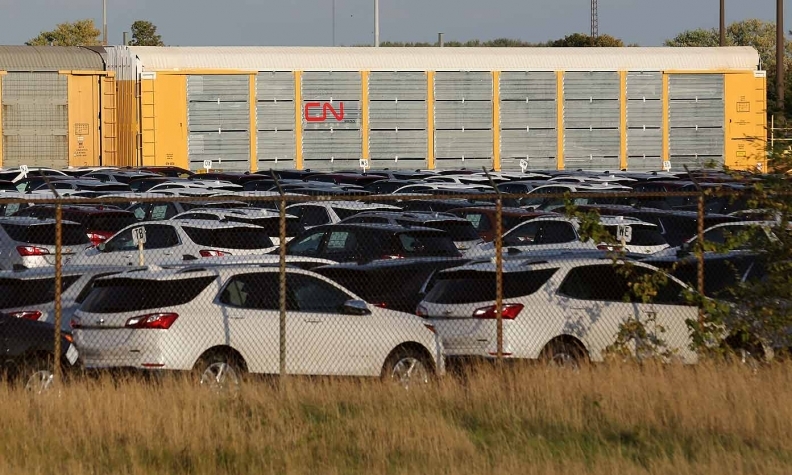 Chevrolet Equinox crossovers await shipment by CN Rail next to General Motors' CAMI assembly plant in Ingersoll, Ontario, on Oct. 13, 2017. OTTAWA -- Canadians outraged by U.S. President Donald Trump's attack on their prime minister have called for a consumer boycott targeting the United States, but indignation may be hard to sustain in a nation enamored by U.S. popular culture and larded with American goods. A push for some sort of reprisal in response to Trump's personal attack on Justin Trudeau has gained force since Canada's Parliament on Monday condemned weekend broadsides from its ally amid an escalating trade dispute. "So, if this president insists on punching you in the nose and eating your lunch, why would you continue to pretend he's still a great neighbor and go over to his place to spend your time and money?" implored an opinion piece in the Toronto Star. "Empty hotel rooms and campsites send a message." Trump called Trudeau "very dishonest and weak" and withdrew support for a Group of Seven communique reached at the summit Trudeau hosted in Quebec on Saturday, and White House trade and economic advisers added insults on Sunday. Underscoring ties that bind the North American neighbors, the United States is the top destination for Canadian vacationers - including hundreds of thousands of retirees who winter in the sun belt. Canadians made 42 million trips to the United States in 2017. Canada's population is 36 million.